If you don’t practice yoga because you don’t know where to start, here is a simple 15 minute practice. Very basic, no special equipment or space needed. This simple practice will keep you energized, engaged and dedicated. Lie on your back on the floor. Draw your left knees into your chest, place your left foot on you right knee, place right hand on left knee, extend left arm out from side. Slowly take left knee to the right and turn your head to look over left arm. Stay here for 5 breaths. Then release your arm, bring your knee to center, and lower foot to the floor and repeat on the left. Bend knees and place feet flat on the floor hip width apart. Extend arms down sides. Contract the abdominal muscles starting in the pelvis and up to the ribs. On exhale lift up the sit bones and roll up on your shoulders. Keep your head straight, do not turn to the side. Hold for 5 slow breaths. Slowly lower to the floor, repeat. Roll to the right and come onto your hands and knees. Tuck your toes under, and very slowly straighten your legs and lift your hips toward sky. Place your head between your arms. Hold for 5 breaths. 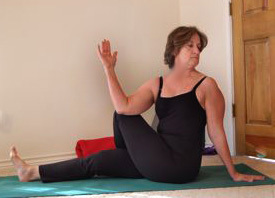 Lower knees to the floor and come to a sitting position with legs extended. Exhale and fold forward, lowering your torso toward your thighs. Reach you hands forward and hold onto you legs or feet. Hold for 5 breaths.